St Johns or Saint Johns, is a small town of around 3,500 people, at the junction of US 191 and US 180, 60 miles from the larger city of Holbrook. The Little Colorado River flows past to the east, sustaining a thin band of greenery and some irrigated land at either side, but most of the surroundings are dry and desert-like, including an area of colorful badlands 4 miles northeast. The town is home to the Apache County Fairgrounds and St Johns Industrial Air Park, and its limited selection of shops are found mostly along US 180 (Cleveland Street), a few blocks west of the center. 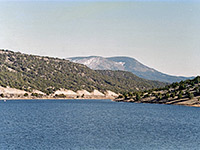 St Johns lies at the north end of a very scenic section of US 191 through the White Mountains of east Arizona, a section known as the Coronado Trail, and which 11 miles south of town reaches the main leisure site in the area, Lyman Lake State Park. Following the 2016 closure of Days Inn St. Johns, at the junction of US 180 and US 191, there are currently no chain hotels in the city.